Iredell County Animal Services will accept owner surrendered pets by appointment only as space allows. Please call 704-878-5424 to request an appointment. For faster service, please complete the Pet Surrender Form and bring it with you to your scheduled appointment. *Owner or caretaker means: Any person, group of persons, firm, partnership, or corporation owning, keeping, having charge of, sheltering, feeding, harboring, or taking care of any animal or stray animal after forty-eight (48) hours without notifying the animal shelter of the animal’s whereabouts. The RedRover Relief program provides financial assistance, resources and emotional support to pet guardians struggling with economic hardship when pets are in need of urgent and emergency veterinary care, as well as support and resources to help victims of domestic violence escape abusive environments with their pets. 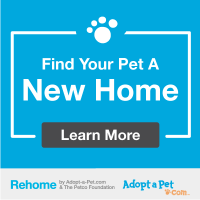 An independent site designed to help you responsibly re-home your pet.